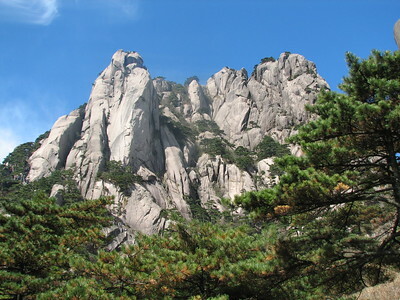 Huang Shan (meaning Yellow Mountain) is a mountain range that has played a leading role in the cultural, literary and artistic history of China because of its scenic beauty. It has attracted a large number of poets, painters and other artists. Its attraction lies in the peculiar shapes of the granite peaks, in the weather-shaped Huangshan Pine trees, and in views of the clouds from above. The area also has hot springs and natural pools. The Huang Shan are located in southern Anhui province in eastern China. The mountain range comprises of 77 larger peaks. The mountains were formed in the Mesozoic, about 100 million years ago, when an ancient sea disappeared. Later, in the Quaternary, the landscape was shaped by the influence of glaciers. Because the mountain tops are often above cloud level, they offer views of the clouds from above and interesting light-effects. How many Chinese fit on one mountain? The record must have been broken when I visited this Saturday. I arrived at 9.15 a.m. at the Jade Screen cable car station, deliberately chosen because the Lonely Planet guidebook warns that the most popular Cloud Valley Temple Cable Car can see waiting times up to 1 or 2 hours. Well, I could join the queue just before the 'From here it's a two hour wait to the cable car'-sign. At the mountain itself there wasn't much space to walk at your own pace either. I had to troddle along with the tourgroups and the mostly unfit Chinese (must be all those cigarrettes). Underway I passed the legendary Chinglish sign "A relaxed and happy feeling comes from the harmonious coexistence between human and nature". I didn't feel relaxed at all! And I only stayed happy because the sun was shining on a November morning and I just ate two chocolate muffins. The landscape at Huangshan is undeniable pretty, but it's not a good visiting experience like this. Maybe the Chinese officials should consider to restrict access considerably (the already heavy entrance fee obviously doesn't deter many). If you want to go there, it's probably better to stay overnight to get a more intimate feel for the site. And don't go on weekends or holidays. I have climbed Huangshan in Winter about 16 yrs ago. And at that time, the cable car didn't work because the lines were frozen. So I attached dried grass soles to my trainers, bought a walking stick and walked up Huangshan from the base. It was cold and the small steps were covered with thick ice which made walking rather dangerous as it was easy to slip on the ice.I remembered the air being so fresh and the pine trees being so old and so beautiful.When I got right to the top near where my hotel was, I remembered it started snowing heavily.The next morning, the clouds in the sky formed a "cloud sea" around the peaks of the mountains. It is an amazing sight. Winter is definitely unforgettable in Huangshan. From Shanghai to Huangshan, it will be best to take the 5-6 hour bus ride. Trains going to and coming from Huangshan take longer. If you decide to spend the night in one of the hotels in the peak, you will need to book a room in advance. One advantage of staying overnight in the mountain is viewing the sunrise the following morning. Do not miss Tiandufeng. Huangshan is uniquely Chinese, and if you could discount the crowds, the peddlers and the loudspeakers, it will touch you with its grandeur. The best part for me was after dark. I went to PaiYunLou (Cloud Dispelling Pavilion) with a few friends, we lay down on a cliff side and saw the valley spread below us, and counted shooting stars through the night! Very special! The old black-and-white towns unique to Anhui province that lie scattered around Huangshan are worth a visit too. If you can, book your own bus and visit the less well known towns other than the ones listed on the World Heritage list to avoid Chinese crowds, loudspeakers and peddlers. To me Huangshan is the most beautiful nature sight in China, I can see why it has been (and probably still is) an inspiration to poets and painters all over China. Each day can be a different experience because of the weather-conditions. When I climbed its incredible amount of steps in 2000 it was foggy, and that gave a mystical feel to the mountain. This is one of the most breath-taking places I have been to. The beauty of Huangshan is unparallel in the world and cannot be simply described by any words. Visual effects of Cloud, Fog and Mist: "often further enhanced by cloud and mist effects"
112 Community Members have visited.